Small steps can create big changes in your community's food quality and food security, helping to get more healthy food to more people and support a better food system. Ali Berlow shows you dozens of things that anyone can do, from creating a neighbourhood kitchen for preserving fresh food to mapping farmland, connecting food pantries with food producers, starting a school garden, and organizing a community composting initiative. Every action you take can help keep farmers on the land and family farms intact, keep money in the local economy, reduce the carbon footprint associated with food transportation, and preserve local landscapes. "I have seen, with my own eyes, Ali transform the food eco-system in her community through direct action and activism. With her feet planted firmly on the ground, but her vision soaring far ahead, Ali lays out the road to change with boldness, courage, and passion. Bravo, my friend!" "If Michael Pollan sounded the battle cry, Ali Berlow issues the marching orders. 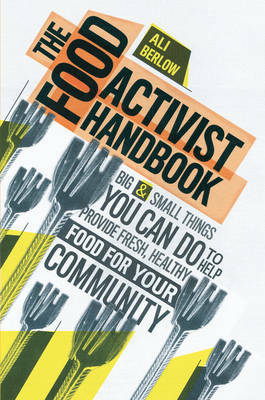 Think of this book as food activism for everyman. It's an elitist movement no more -- everyone deserves clean food." "It's been said that it takes a village to raise a child. And once the villagers are roused, Ali Berlow suggests, we can surely do something to eat better, more sustainably, and more humanely. This is a clarion call we would all do well to heed." "Ali Berlow has written an empowering guide to improving the food in our communities. In this wonderful, thought-provoking book, she lays out both big and small actions, inspiring us to get started -- and, with this must-have tool in our hands, to achieve success." "It's not enough just to eat healthy ourselves. We must all become food activists if we are to have a sustainable future. Bravo to Ali for so beautifully showing us the path forward." "An excellent job of providing -- in digestible chunks -- dozens of steps anyone can take." "From mapping farmland to starting a school garden, Berlow gives readers actions they can take on an individual level in any community."